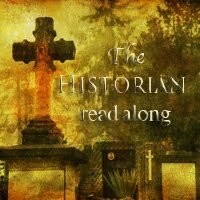 Coffee and a Book Chick sent me a note that there is going to be a read along of The Historian by Elizabeth Kostova. I read The Historian years ago and loved it so I thought why not read it again. Besides, every time I go to put something back on the shelf, I keep coming across this book. A sign maybe? I think it is. It’s going to be read in chapters averaging about a 100 pages a week so a very doable pace that means I won’t have to drop anything else I’m reading to play along. More info is at On the Ledge Readalongs if you want more details.